Welcome to one of England's few remaining ancient forests covering over 27,000 acres of woodland. The Royal Forest of Dean lies in the western part of Gloucestershire between the rivers Wye and Severn, on the borders of Wales and the Wye Valley. This is the opportunity to discover a part of England unlike any other. The area offers many beautiful walks, spectacular scenery and a chance to relax and get away from it all. There are several busy market towns to visit, lots of outdoor activities to pursue and some excellent hostelries close by. One of the many rural hamlets in the area is Edge End, with stunning woodland walks, on your doorstep. The market town of Coleford is only a short drive away. 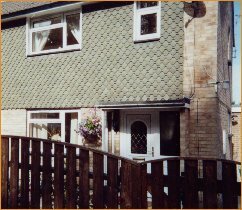 A well - equipped, semi-detached house with its own garden and nearby off road parking. The property can accommodate a maximum of seven but is ideally suited to sleeping five. This is a small single bedroom, ideally for use as a children's room but can accommodate an adult if required. Duvets, bed linen and towels are provided and gas and electricity is included in the rental cost. The house is served by gas central heating. The garden area is enclosed both front and rear and some picnic furniture is provided. There is off road parking for one vehicle near to the rear of the property. Our holiday lets normally operate from Friday to Friday but shorter breaks may also be available. The property is available from 3pm on the day your holiday begins and you must vacate by 10-30 am on the day of departure. Smoking within the house is not permitted and pets are not accepted unless by special arrangement. A completed booking form together with a 20% non refundable deposit is required when you book. The balance together with the £50 indemnity charge falls due 4 weeks prior to the first day of the hire. For further information, to check availability, or to make a reservation please telephone Pam or Simon on 01527 874262 or alternatively you can email using the link below. We pride ourselves that you will find the property clean, comfortable, well equipped and in a good state of repair so we ask you to treat it with respect and leave it in the same good order. A payment of £50 indemnity against damage or breakages is required. It will be refunded to you by post at the end of your stay providing the property is left in good order and after any deductions for breakages have been made. We would point out that tenants are held to be legally responsible for any damage and breakages and they should be reported as soon as they occur.